Wouldn't it be nice to have interactive tools in the OACS threads? Features such as: number views, number of posts and etc. Then, the author of the post could get a clue about clarity, objectiveness, participation and etc. That way, he/she could self-evaluate and improve his/her contribution to the community. from me there's nothing against improving the forums package, some maintenance we did just recently for instance. Could you elaborate a bit about what you have in mind? Could you make a list of all the features you think introducing togheter with their use case? Could also be that somebody already has this as custo mization in their instances and can provide some snippet. We also do have some extra feature downstream and at some point we might put some effort into contributing this kind of stuff. in general, there is the "views" package, which provides such functionality in a generic way. If you want this for a site that you are maintaining, feel free to experiment with this. Using/integrating such features on openacs.org would be another topic, since this can mean as well a certain privacy invasion, depending on what is presented in detail. Indeed "views" pkg helps me a lot customizing codes. The idea came after Brian's comments in my last post, in the DEV forum. Indeed, my post is hard to understand and the topic's confusing too (i.e. hard to explain without feedbacks). Thus, I thought about tools to provide instant feedback, letting the machine to show a few statistics can tell a lot about without so much work from other users. Another thing is because I've always felt a lack of popularity and massive participation in the OpenACS community. It has been many years already, and I simply don't understand why such a good framework (i.e. robust, scalable, and the list goes on and on) is so unknown among I.T. professionals worldwide. Is it because of the learning curve? Are TCL & XoTCL very hard to comprehend? What are we missing here to spread OpenACS out and make it popular worldwide? Normally, one gets better answers on simple and clearly formulated questions. When people have troubles to understand the question (maybe due to lack of background information, or complexity) they find it hard to answer. This is a universal principle. A lack of response might have many reasons. There are many people are using OpenACS in their daily work, but they don't follow the forums, or at least, they don't participate... for whatever reason. It is also a fact that we have more "old sites" than "new sites". 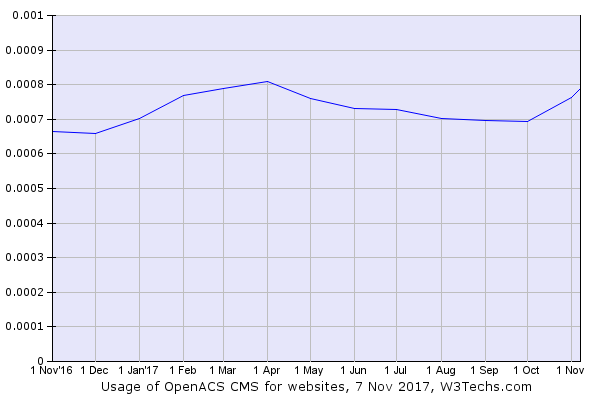 Actually the number of public OpenACS sites is now higher than it was a year ago, which might be due to the latest release. Certainly, when we all work together, we can improve the product, which has many nice properties - but as well rough edges.